If Bejeweled has become your lapdog and you its master, there’s a similar game in waiting, only this time it includes dungeons, swords and magic potions that send enemies into the afterlife. Welcome to The Dungeon Saga, an endlessly addictive Bejeweled spinoff with enough twists to keep you playing for hours. The game starts with a haunting animation complete with ghoulish background sounds. 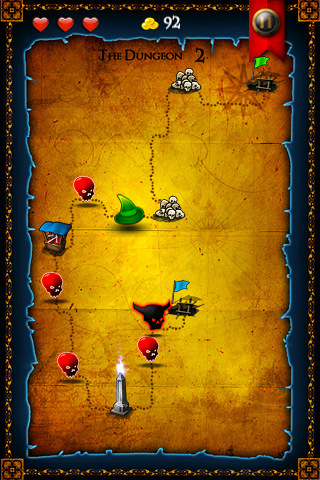 Then you’re in a dungeon map layout where you tap to advance from one enemy to through this game’s equivalent of levels. Once you’re in the dueling dungeon your avatar appears in the upper left hand corner set against the ghoul of the moment. Along the way you fight mummies and others, but the important part about this upper section of the screen is the score tallies. 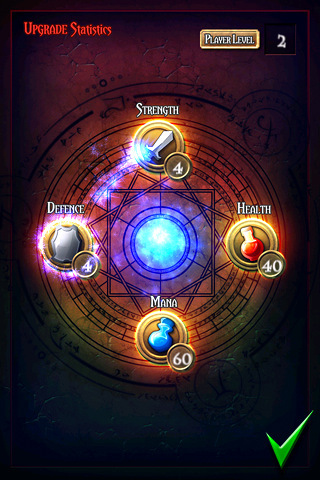 Both players in battle have status bars that show their health in red, sword power, shield power, spell power and more. Each character also has a count for experience points and gold coins, meaning there’s a bit to keep track of to win in The Dungeon, but the strategic brainpower you’ll have to expend is right on target. The point of the game is to build up points until you can diminish the health of your enemy, but along the way you have to make choices based on when to activate spells, when to build up sword power as opposed to defense, and much more. To collect what you need to win you sift through the screen of tokens and run your finger over three or more items in a row the way you might choose jewel colors in bejeweled. Instead of trying to collect as long as possible though, this game is about capturing the right battle powers at the right time without leaving opportunities open for your enemy. The result is a wonderfully addictive back and forth version of war, only instead of trading endless cards your character has spell powers, can buy capes that improve defense in stores, and much more. This is a bold statement, but The Dungeon might beat Bejeweled in the fun and addictive departments, and it’s because of the multidimensional strategy required to win. 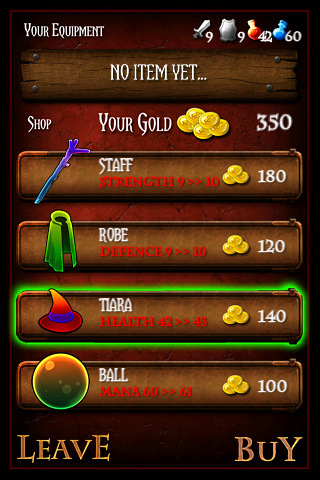 Bottom Line: The Dungeon Saga is like the next generation of Bejeweled combined with Settlers of Catan style strategy set in battle. 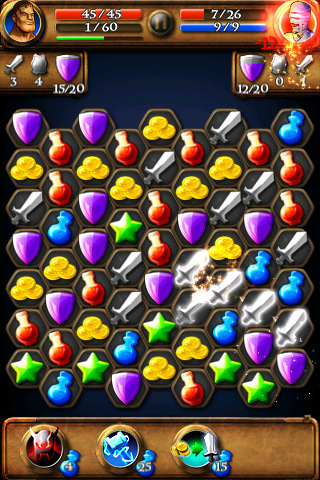 The mashup sounds unusual (and it is), but this puzzler is a blast.